Carefully aged and dried cane for optimum consistency. Ideal for Jazz, Rock, Pop, Funk etc. Great reeds when I eventually receive them. 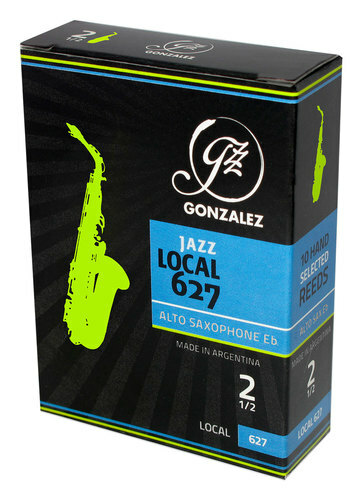 I am very happy the Gonzalez Jazz Local 627 Alto Sax Reeds and have been using them for some time. The Gonzalez alto sax reeds are the next step in my saxophone progress! I have used the Gonzalez clarinet reeds for some time now but for some reason or other not the alto sax ones. Having tried them now they will be my first choice reed from now on. Instant response and great sound. These are hard reeds and I think that the general rating is inaccurate. I have recently been playing some of 2.25 hardness and they have taken a while to be playable. I found one which seemed a little softer than the others that I have tried & it had a very good sound. They were harder than my 2.5 V16's and also my Marca Jazz 3's. 2's next time!